Motor sailing for lack of wind, we arrived at what is generally known as Devil’s-Hoffman. Several tiny cays (hope you are pronouncing this “key”) are closely scattered between the two larger ones. We planned to anchor in the lee of White Cay off its pretty sandy beach in plenty of water; plan B was behind Saddleback or Fowl Cay. In the Bahamas, much of what we take for granted in our east coast cruising is a bit sketchy. Charting is not as extensive or as up-to-date and depths may not agree to the chart – paper or electronic. Any wonder that the first page of the Explorer Chart book provides excellent photographic examples of how to read the water along with advice to have enough sun overhead to do so, especially when close to land. White Cay was filled with depth hogging monos and Saddleback was quickly crossed off the chart as an anchoring spot when even we, with 3 ft draft touched bottom- just one hull though. Fowl Cay on the other hand had plenty of water, 11-15 ft where the chart indicated seven. We make notes on the chart and in the guides as we go. This placed us within 120 ft of Hoffman and a shorter dinghy ride to the second beach where we’d find the path that leads to a blue hole. 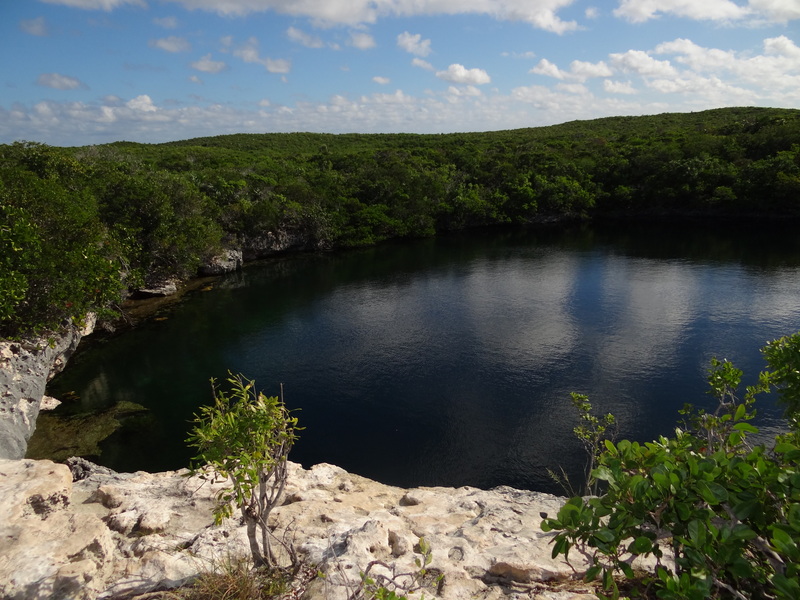 For those unfamiliar with a blue hole, as we were, this one’s story reads like this: a round, salt-water hole about the size of a baseball infield. It connects to the ocean near the bottom of its 600 ft depth. (no anchoring for monohulls though). 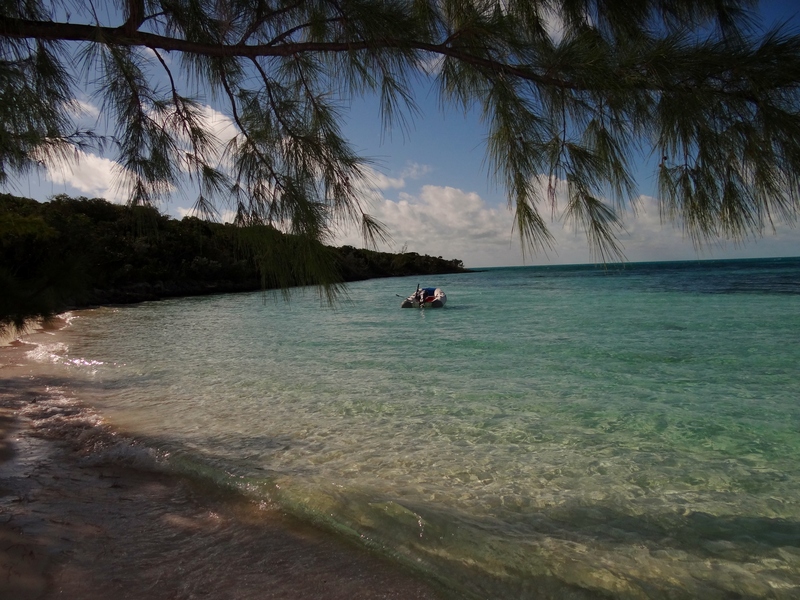 Explored by Jacques Cousteau, it is thought to have been formed by a natural cataclysm. I’d rule out a sinkhole that sank since the entire island is rock. The path ends right at the edge of the overhanging rock platform and as you look down, no way is that jump only 25 ft. Scoot down the tiny path at the edge to water level. Look up and declare, “oh, that’s not bad at all.” From above, the 25ft appears more like 50, while from below it seems more like 20ft. Benj can attest to a screamin’, exhilarating 25 ft jump that feels like 50! Russ remained in the “not brave adult” group and me- what else, I could barely look down and remained a dry photographer of the blue hole swim and float outing. 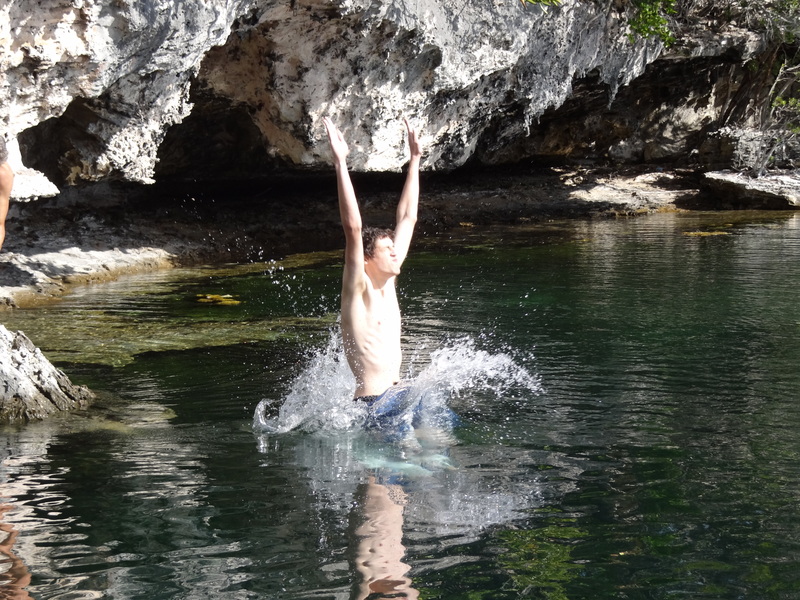 Tuesday afternoon we explored White Cay; sandy beach on the west side, rock cliffs and outcroppings on the east. We picked up a handful of sea glass, an intact sea biscuit and made faces looking at the strange gelatin-glob creatures nestled in the rock crannies; they were the aquatic equivalent to a Venus Fly Trap. As we walked along the beach to collect our stuff and thus the lonely camera, a small terrier who’d been brought ashore was barking like crazy. Took a second to realize that he was doing a couple rounds with a crab he’d dug out of its hole; the crab clearly had the upper hand- claw and finally escaped into the water. By that time I’d grabbed the camera and managed to get a couple of in-water shots.